A radical initiative developed by clinicians and scientists in Southampton is set to change the way children’s medical research is performed in the UK. In a report published today (Tuesday), the Royal College of Paediatrics and Child Health has called for NHS trusts and universities to follow the city’s example of combining adult and paediatric researchers together to determine the early origins of disease. 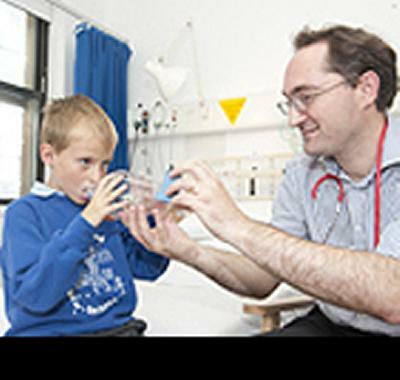 The National Institute for Health Research (NIHR) Respiratory Biomedical Research Unit and Nutrition Biomedical Research Centre – partnerships between the University of Southampton and University Hospital Southampton NHS Foundation Trust – focus on translating the latest laboratory and clinical research findings into improved treatment for patients. Following the work of Professor David Barker in the 1980s, which found the link between birth weight and lifetime risk for coronary heart disease, researchers have established chronic diseases in adults, such as diabetes, heart diseases and cancer, may be prevented by early interventions in nutrition, diet and lifestyle of pregnant mothers, infants and children. In the NIHR Southampton Respiratory Biomedical Research Unit, consultants in adult and paediatric asthma and allergy at Southampton General Hospital are jointly studying children, adolescents and adults with asthma to give an insight into how the condition develops throughout life, with a view to early intervention and prevention of the disease. Meanwhile, experts in newborn care based at the Princess Anne Hospital are investigating how a life-saving treatment for premature babies – surfactant – and early nutrition might be applied to help prevent and treat chronic lung disease in later life. “This report calls for a focus on lifelong healthcare and highlights the importance of research in children’s health, with Southampton providing a model example of the collaborative infrastructure centres should have in place,” said Professor Howard Clark, co-author of the report and head of the academic department of child health at the University of Southampton. He explained: “What we have seen, not just in the UK, but across the world, is clinicians and academics adopting a treatment rather than prevention approach to the current major healthcare challenges of cancer and chronic respiratory and cardiovascular disease. A review article presenting a summary of the RCPCH’s commission on child health research report, Turning the Tide: Harnessing the power of children’s research, has been published online by The Lancet to coincide with release of the full report.